If the above apply to you, then you are not alone, a lot of people fall into this trap for all kinds of reasons. taking responsibility for your team’s work is part of your job, but that doesn’t mean you have to do everything yourself. You need to leave some responsibility to other people, and to respect their judgement. Allocating or delegating tasks tasks to team memebers can help – but you must be prepared to trust them. You may also take on jobs that you know you can do because it’s easier that doing your own job. Then you can tell yourself that you’re too busy. Lack of organisation and prioristising could be at the heart of this. The next section will help you. Stop and think about each task as you start, and ask yourself whether is is actually your responsibilty. Know what you should be doing. Plan your day ahead, building in time for paperwork. 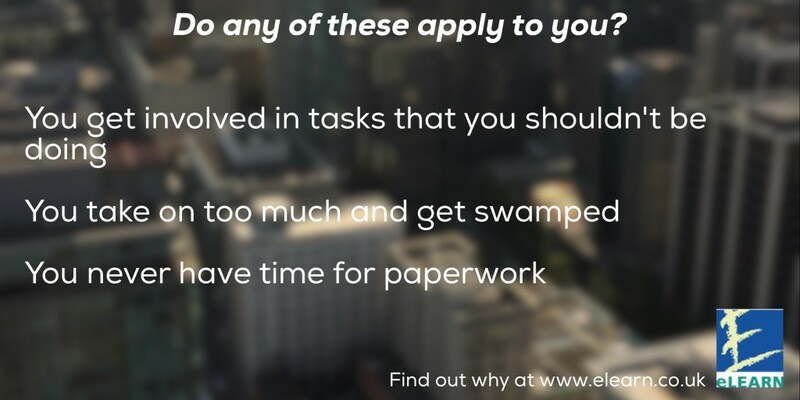 Prioritise your workload more effectively. Delegate and allocate more tasks. Take responsibility for your time, as well as everything else. Be aware of your need to keep busy – and be wary of it. Elearn have had a passion for helping organusations and individuals achiever thier goals since 1999. We offer self study courses for individuals and in-house training for organisations.